Educationalists and journalists have long beaten a path to Singapore to discover its educational secrets. Children within its school system perform better than any of their international peers apart from Shanghai, according to the PISA rankings, and a whole industry has grown up attempting to decode its formula. The city state is perhaps the world’s most astonishing story of educational improvement. Its transformation from a low skill, low paid nation with high levels of illiteracy 50 years ago to a first world economy today, with a 1% unemployment rate provides inspiration and hope for policy-makers everywhere. But the story of education in the ASEAN region goes beyond Singapore. The legions of educational tourists would do well to extend their trip to the region’s other education systems, which have also taken giant leaps forward. In the Philippines, basic public education has recently been extended by two years to grade 11 and 12 – finally giving the poorest students the chance to study at senior high school and go on to the best universities. Since 2010, the education budget has more than doubled, 30,000 new classrooms have been built and 43,000 new teachers hired to prepare for the effort. A bold new government voucher scheme has been introduced to allow students (where state provision isn’t available) to enroll in private schools. Vietnam caused astonishment when in 2012 it entered the PISA tests for the first time, and returned stunning results – scoring higher in maths than the UK and the US with a ranking of 17th out of 65 countries. This from a country with a per capita GDP of only $1,600. It has invested heavily in education – making up a fifth of government spending, and shifted its curriculum away from rote learning. But, for all the impressive progress in the region, international education rankings alone will not protect workers from the brutal forces of economic change that will sweep through the world economy over the next two decades – destroying entire job sectors, creating new ones, and demanding a constantly changing mixture of skills. The recent Future of Jobs report published last year by the World Economic Forum’s Global Agenda Council of the same name, based on a survey of executives in 15 of the world’s largest economies, argues we are entering a Fourth Industrial Revolution, in which over 7 million white-collar and administrative jobs could disappear due to technological change in the next five years alone. New sectors – from nanotechnology to robotics to data analysis – will replace some (but not all) of these jobs. 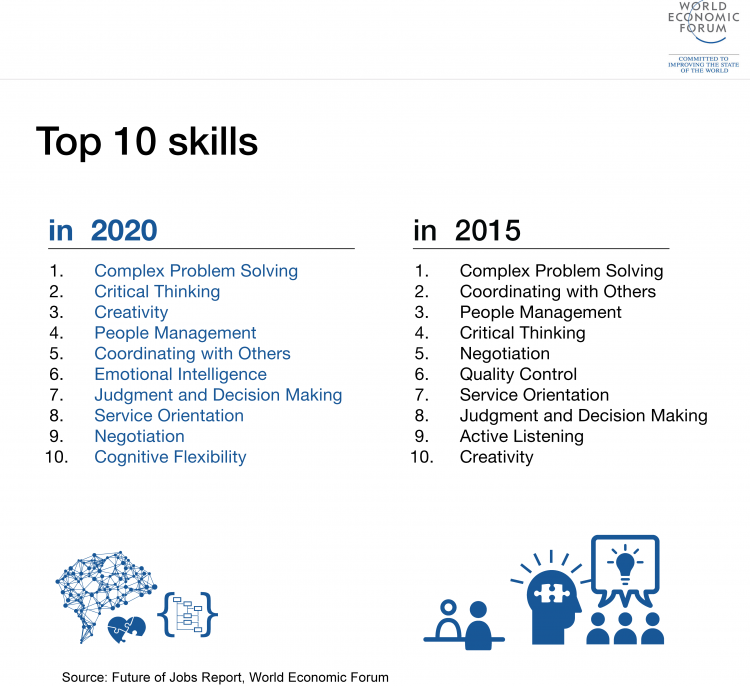 The future economy will need strong vocational skills – which are often still treated as the poor relation to academic routes – as well as soft skills. Laszlo Bock, who is in charge of hiring at Google, says that “while good grades don’t hurt”, the company is looking for softer skills too: “leadership, humility, collaboration, adaptability and loving to learn and re-learn”. Employers throughout the world report that the education system is not delivering the skills that they need. In 2015, more than a third of global companies reported difficulties filling open positions owing to shortages of people with key skills. 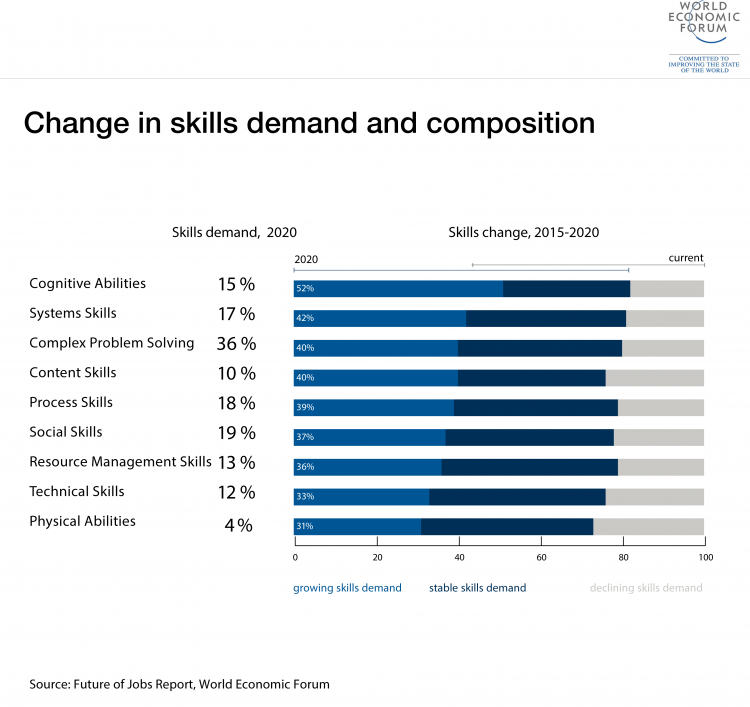 Even in education poster-child Singapore, a 30% increase in skills shortages was reported last year: a reminder that there is more to a world-class education system than outstanding PISA scores. There are already signs that governments in the region are beginning to realize that academic skills will not be enough. Malaysia’s deputy education minister recently called for an end to spoonfeeding. While, earlier this year, Indonesia’s president, Joko Widodo, returned from a trip to Europe and called for closer co-ordination between the economics and education ministers to ensure Indonesia has a “work-ready labour force”. Malaysia launched the vocational education scheme 1Youth 1Skill in 2010 to provide “what industry wants”. Young people who choose this route have a higher success rate at securing jobs than graduates. Singapore radically overhauled its Institute of Technical Education (ITE) a decade ago. Previously a joke circulated that its acronym stood for “it’s the end” – the last resort for the academically weak. Today its university-inspired set-up offers award-winning programmes that attract students from around the world. Education ministers throughout the world are rightly beating a path to Singapore’s door to find out the secrets of its spectacular success in science and maths. But, in learning these lessons, they should remember that, as far as we can tell, the jobs of the future will require flexibility, creativity, independence of thought, and teamwork – whether they are in Kenya or Kuala Lumpur. We will pay a price if we turn our schools into exam factories where these qualities have been squeezed out of the curriculum. In conversations at the World Economic Forum on ASEAN 2016 summit next week, we should remember that education doesn’t begin and end with PISA scores. Just a couple of weeks ago, I visited Ethiopia to attend the World Economic Forum’s Africa Summit – a choice which confused many of us, as, like many other African countries, doesn’t strike you as being a natural choice to host such an event, but when we scratched beneath the surface, what impressed was their total focus on applying science and engineering to boost their economic and agricultural productivity, which is obviously working as they’re now the world’s third fastest growing economy. Imagine that! I remember, as a young boy, cycling to my local record shop to buy the charity single that brought Ethiopia into focus, and where we all sang along to “do they know its Christmas time at all”. And it’s not the only example of a country that we think of as ‘developing’ as being in a vastly different economic environment than we might think. While we all know of the rise of the BRIC economies, but did you know that a country like India produces more engineers & doctors than the whole of Europe put together? Both examples show that investing in STEM education makes good economic sense. Education can be the driver for economic growth. But it’s not always universal and girls and women are often being left behind. There’s an obvious moral argument to this – how can it be right to leave behind so many people – but there’s also an economic argument. On what basis can we look at ourselves if we don’t do more to ensure that we create generations of female mathematicians, scientists, engineers, and technologists? Did you know that since the inception of the Nobel Prize for Physics, only two women have won this prize? Only four have won the Chemistry prize. How can this be right? We can drill even further as the statistics for women “of colour” are even more alarming such as; only 2% of all women professors in the US are “of colour”. How can this be right? The work that the Varkey GEMS Foundation does with UNESCO concerns the recruitment of more women into the teaching profession, the skilling of these recruits to ensure girls advance in STEM subjects, and an ongoing commitment to their professional development as educators. As a company, if there’s one thing that GEMS has learnt from educating children is that good teachers matter. Who stands at the front of a classroom often makes the essential difference to a child’s prospects of success. As a charitable foundation we believe that the role & status of teachers has become so derided that we fail to appreciate their critical contribution to a country’s progress. We also fail to understand the way in which the teaching profession is changing, for example as technology allows for easier transfer of knowledge, the classroom teacher takes on an ever more critical role – that of a “mentor”. In this avatar, teachers can have an incredible influence on parents, students and the wider community, and can convince those who don’t believe that science pays, of the rewards advancement in STEM subjects can hold for families and communities – whether in cosmopolitan cities like London or Paris or in the most rural locations in Lesotho or Kenya, where our intervention is targeted. No longer are STEM subjects taught in isolation, real world challenges demand an inclusive, combined approach. In this new way of learning, teachers become even more vital as they join the dots for students to make the subjects real and practical. We need to be clear in our minds that a focus on STEM education can boost a country’s economic chances – which in these challenging and austere times is important to understand. But, clarity of thought is one thing, we ought to also bear in mind the moral argument in training girls and women, for they have been neglected for far too long by a male dominated political culture, which is hard to defend on any basis. Teachers are the backbone of the education sector. By investing in them, we invest in ourselves. As a father of two daughters, I wanted to convey my thanks to H. E. Ms. Irina Bokova, Director General of UNESCO for convening such an alliance to further the education of girls and women and look forward to reporting back the progress we’re making in Lesotho & Kenya over the next few years. Remember those words? Remember Bob Geldof on TV during Live Aid launching into a tirade asking people to call in to pledge money for the people of Ethiopia? Well, guess what? I’m on my way to Addis for the Africa Summit of the World Economic Forum, which last year was held in Cape Town – in Africa’s largest economy – South Africa. So, when they announced that this year it’d be in Ethiopia, I, and many others, looked a little puzzled – about their choice. Since then, I’ve paid attention to everything “African” and am actually looking forward to attending, knowing that Ethiopia is one of world’s fastest growing economies – YES, you read correctly – Ethiopia’s BOOMING – who would have thought!! I’m going to be live tweeting from Addis, so please do follow me on Twitter if you want to know what’s being said.